This December many Wii owners will be delving into the world of Disney Epic Mickey, taking a moment to appreciate Mickey's animated past with 2D platforming sections in that game which allow you to play through his classic cartoons. However, 16 years ago UK developer Traveller's Tales pre-empted Warren Spector's game by nostalgically representing a history of Mickey Mouse in Mickey Mania. This game enabled players to bound across six of his most famous 'Feature' cartoons, spanning an equally epic 62 years and his most famous appearances. It's clear that in 2010 Mickey Mouse is being thrust back into gaming's limelight, but in 1994 Mickey Mania had big yellow boots to fill, because he was already established as a 16-bit video game star. The precedent was set in 1990 by SEGA as despite a sedate pacing Castle of Illusion was the standout Mega Drive platformer in the years before Sonic. 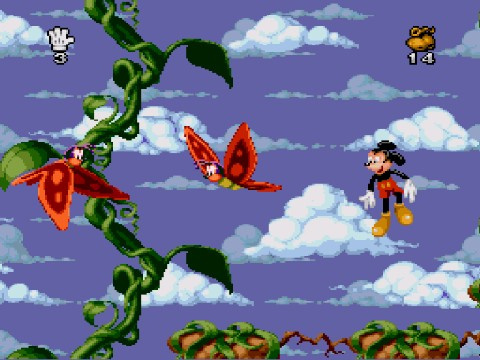 Late in 1992 two more Mickey games impressed with lavish 16-bit visuals, both Capcom's SNES title The Magical Quest and SEGA's Mega Drive World of Illusion demonstrated that Disney's mascot was ideally suited to this genre. 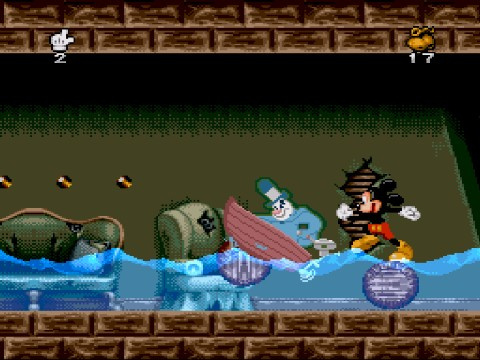 This game's premise had a strong foundation, because you control Mickey as he relives his 'Timeless Adventures' starting with his first ever animated feature, Steamboat Willie (1928). 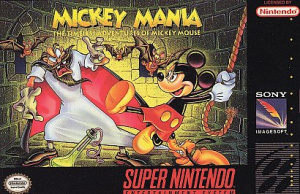 The six levels run chronologically through the classics, after the black-and-white intro level Mickey's journey bounces through The Mad Doctor (1933), Moose Hunters (1937), Lonesome Ghosts (1937), Mickey and the Beanstalk (1947) and ends with a boss battle against his arch nemesis Pete after The Prince and the Pauper (1990). There is a loose story attached in which you rescue a classic Mickey trapped in each level and save Pluto, but the plot is really just a brilliant excuse to theme each level with a legendary cartoon background. While it's true that Mickey Mania lacks originality, it is linear and there are not many secrets or chances to detour from a set path, conversely its design is pure retro platforming. Just like with Castle of Illusion it's deliberately slow paced, encouraging you to tiptoe through many of its levels. For example, Mickey's white finger splayed glove represents your energy bar and rushing through a level like Moose Hunters will see each finger crushed by falling boulders, branches and a charging moose. Controls are simple, with B for jump and Y to launch marbles at enemies. There's no double jump but you can bounce off enemies to reach a higher platform, and this is effective for killing weaker enemies, but neither this nor the marble attack will dispose of some larger foes. There are some basic puzzles included, but filling up a beaker with chemicals and heating it on a Bunsen burner or watering a tulip to make it grow into a platform are not likely to tax you for long. Treading carefully and dodging is your most important strategy, as skeleton bones explode across the screen, insects burst out of pods and rocks spit out of lava, putting your D-Pad ducking skills to the test as you soon learn that it makes sense to run a few steps back until trouble has passed. The game makes up for a lack of originality with varied gameplay: Mickey swings from chains, an elevator carries you past lurking skeletons and you guide chandeliers towards a walkway, or take a ride on an acid leaping gurney. It's the set-pieces that ensure the gameplay stays fresh, but also the technical skill of the Traveller's Tales team at presenting each exciting moment. For example, towards the end of the game there is a climb up a rotating tower, and as barrels fall and wooden platforms collapse it feels like an homage to 8-bit title Nebulus, while boasting a visual effect rivalling the tower on the third level of Super Ghouls 'n Ghosts. 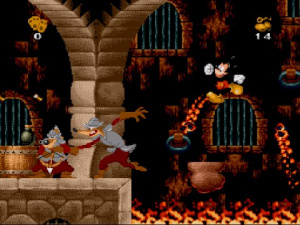 Mickey Mania was also one of the first games to feature an out-of-the-screen chase sequence and even if the Moose Chase is short it is clear that it was an inspiration for similar sections in PlayStation games like Crash Bandicoot and Disney's Tarzan (also published by Sony). In many ways the sprites steal the show, as Mickey teeters on the edge of a platform or skips with his feet as he charges down a slope. Once you reach the final credits you won't be surprised to learn that Disney Feature Animation Florida lent a helping hand to this project, and it's pleasing to see that just as much care and attention was spent on the enemies. The varied visuals extends to enemy and background design, enemies like the lonesome ghosts and crossbow wielding weasels are pure Disney, as is the colour that is packed into the oversized world of Willie the Giant or the lush parallax scrolling for the cutesy beetle infested tunnels. The game has a wonderful charm to its presentation, which is also conveyed in its audio that sets out to represent the theme of each level; Steamboat Willie's tune is upbeat and catchy, Lonesome Ghosts is creepier with bone-tingling rhythms and Mickey and the Beanstalk is layered with the twinkling of magic for an enchanting melody. The audio also assists with the gameplay as Mickey's panicked sampled shriek of "eh oh" warns you that a Moose is incoming or a ghost is about to clobber you. In theory, to a skilled player who knows the enemy placements and level layouts, there is under an hour worth of gameplay here. However, on a default 'Normal' difficulty with only three extra lives and just one extra credit, you will spend much longer than that mastering the game. The 'Easy' level treats you to three credits, but if you die at the very end section of a level and are forced to use a continue you're sent back to the very beginning of that particular 'Feature'. This becomes frustrating, particularly with 'one hit kill' enemies like a lipstick-touting spider that wipes out your entire energy bar with a single charge. Sadly, even with a hard difficulty mode, there is not a large amount of replay value for anyone who finally beats this game. 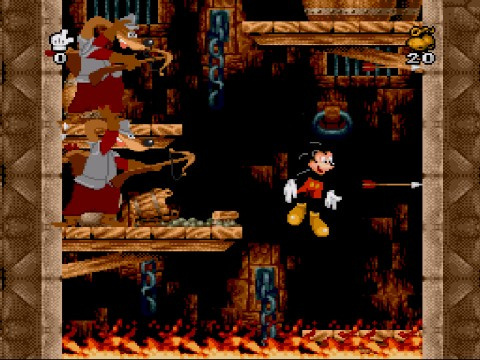 As a small UK developer, it was a relatively epic achievement that Traveller's Tales was confident enough to build a 2D Mickey Mouse platforming game, even competing with The Great Circus Mystery Starring Mickey & Minnie. Traveller's Tales technical expertise, special effects and presentation showed the studio had plenty of untapped potential. Although Mickey Mania's pure platform-rooted gameplay doesn't result in an original play experience, its sedate pace, lack of replay value and stiff challenge are balanced out by exciting set-pieces. The nostalgic history lesson through classic Mickey cartoons is a great setting, plus the visuals and audio carry all six level's themes off with aplomb. The game was so well crafted that Sony deemed it good enough to be converted to PSone two years later without massive alterations as Mickey's Wild Adventure, a strong indication of this 16-bit gem's quality. This is a really fun game. I like how the stages go through the history of Mickey mouse. Starting with his very first cartoon Steamboat willie. All the mickey games on snes were great! Why oh why won't Disney re release these on VC? They are missing a huge opportunity. I loved the Mickey platformers first time around (had Castle Of Illusion on Mega Drive, and Castle/Land Of Illusion of Master System), never got to play much of this though. I remember the Steamboat Willie level and being impressed by the black-and-white gradually coming into colour. I usedto love this game in my childhood. Really. I still want to play it even i've defeated Pete once three years ago. Great level desing IMO. I don't know much about this game, but I love the Steamboat Willie-theme. I only played the PlayStation version (back when I still lived in Italy and when I come to visit) of this game (which was only released in Europe and Australia; why wasn't it released in America, too? ), and I thought it was a great and underrated, imo, game. The visuals in that version were splendid, and the soundtrack marvelous. I still need to beat Hard mode, though. I'm still a bit uncertain about getting the SNES version. On one hand, if I did buy it I would finally own a version of the game and not play it solely whenever I come to visit my relatives in Italy. On the other hand, I'm a bit worried about whether the SNES version is gonna be as good as the PSX version or not (too much fondness for the PSX version). Never played this game. May try the Playstation version. 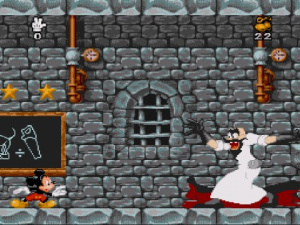 The old Mega Drive/ Game Gear games with Mickey (Castle, Land, Legend of Illusion) were great. Disney itself could bring this games to VC, like Lucas Arts with its games did it before. The only Mickey game i ever bought. I have this game but never played it. Might start with it anytime soon, but so many games lying around, waiting to be played. Great review, really fond memories of this title. I love this game, why isn't this on the VC?!? I'm suprised NL hasn't reviewed MIckey Mouse's Castle of Illusion. Need to snag myself a copy on eBay, great game! Mickey Mania is an amazing game. Everyone should play it. This was my first ever computer game! One of the hardest I've ever played too, but it really is a class act. Good review. The Sega Genesis and Sega CD versions were better. That's right ,the Mega cd version was superior than this one on snes,the best port ofcourse was on psx. Again, I wish the PlayStation version was released in America, too. @StarBoy91 I have both the PAL SNES version of Mickey Mania and the PAL PlayStation version of Mickey's Wild Adventure, so I played them both lots as part of this review. To be honest if you are most used to the PSone version then you will notice that it has added extras, which you will miss in the SNES game. For example the PSone title has loads of speech, crisper CD audio (quite a few of its tunes are different), more graphical detail, plus a far more vivid and varied pastel colour palette. The first part of 'Moose Hunters' and the garden in 'Mickey and the Beanstalk' look great on SNES, but the PlayStation version of those levels burst from the screen with colour. 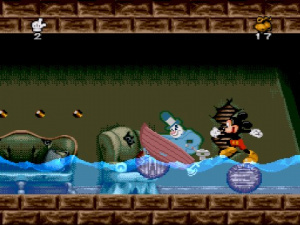 The PlayStation game has more detail to its visuals, with film reel on the side of the screen for the 'Steamboat Willie' level (colour seeps into that level more gradually too), bubbling lava during 'The Mad Doctor' gurney ride and there is occasionally more layers of parallax scrolling happening on-screen. The PSone game also has a second out-of-the-screen chase section involving Willie the Giant, an extra rotating tower section earlier on and a secret bonus level based upon 1935's 'The Band Concert', in which you navigate upwards through a whirlwind by jumping on blue crates. The only frustrating part about the bonus level is that you only get one attempt at it, if you fall off a crate you start back in Willie the Giant's garden instead. As long as you take these differences into account you will still get lots out of the SNES game, after all the PlayStation hardware was far more powerful, yet the gameplay, level design and animations are essentially the same. @WaveBoy I have a real soft spot for the Mega Drive's Castle of Illusion, I would be well up for reviewing that game and I am sure a number of Nlife's other writers would love to review it too. However, the Nlife 'Retro' section concentrates on Nintendo systems, so the only way you are likely to see a review for it here is if it was ever to be released on Virtual Console. Fingers crossed that SEGA can find a way to sort out a licensing deal, because that game would be an awesome platforming addition to the Mega Drive section of Virtual Console. Great game, I have the Genesis version but I never got past the beanstalk level. I love this game...but I hate those exploding skeletons! I still have trouble getting past the second level with them. I wish, I had this game...The only Disney games I ever owned for the SNES and NES were, Aladdin and Chip & Dale, Aladdin was good but I never got past the lava level. Disney loved Nintendo in the 90s didn't they? @R-L-A-George I don't see why. Although Disney published multi-platform, Mickey games usually came out on Sega systems, since they were developed by Sega. And Mario was one of Mickey's biggest competitors in the market. @Willy105 Then why were there so many Disney games for NES's and most were actually pretty good. Mickey's got no tail in this game, I've always noticed that. Mickey has been epic since Walt Disney created him. Do yourselves a favour, and play the Megadrive version. It's far superior to the SNES version which just feels broken and unfinished. I LOVE THIS GAME!!!! It's easily one of my favorite SNES of all time like Donkey Kong Country 2 & Super Mario World 2: Yoshi's Island!!!! This is a wonderful, imaginative game with beautiful animation, graphical effects, and even music. (The Genesis version is, anyway; I don't know about this one.) The collision detection isn't very friendly, but that is no obstacle to my enjoyment. Beyond licensing issues, I know why this was never released on Virtual Console: at the end of the credits, the game tells you to buy it twice if you like it. You'd be able to buy it only once digitally, though! There's the problem.